Click on the button below to view all the tour dates and locations for our Discover Space exhibition. Discover Space: A Cosmic Journey is made possible through the support of the National Science Foundation. The exhibition and its educational support materials and outreach opportunities are part of the STAR (Science-Technology Activities and Resources) Library Education Network (STAR_Net), a hands-on learning program for libraries and their communities. Partners include the National Center for Interactive Learning (NCIL) at the Space Science Institute (SSI), American Library Association, Lunar and Planetary Institute (LPI), and Afterschool Alliance. 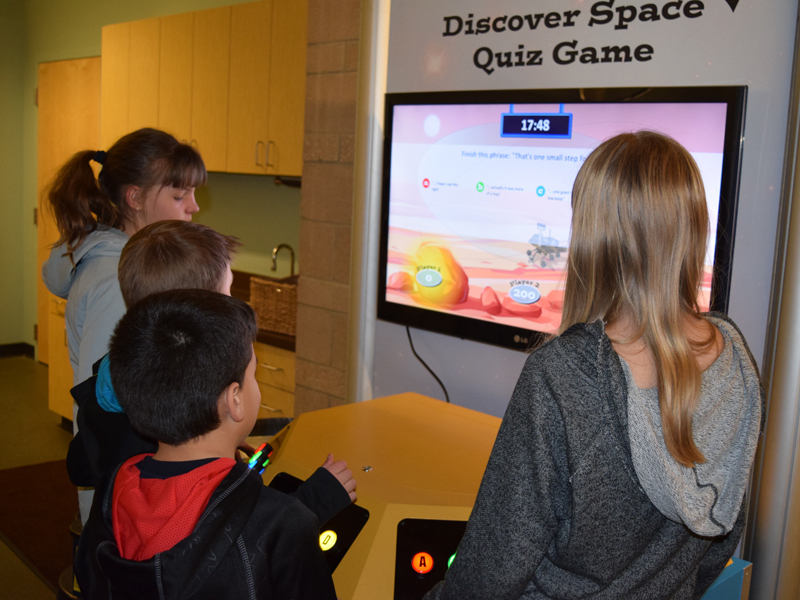 The STAR_Net team selected nine public library sites to host the second national tour of the interactive Discover Space traveling exhibition. Discover Space will tour from April 2016 through March 2018. The nine sites selected will host the exhibition for a period of approximately three months each. The exhibition requires 800 square feet of space for optimal display. Each site was awarded a grant of $1,000 to support public programs related to the exhibition. The Discover Space traveling exhibition includes a research study and evaluation of informal science education in a library setting. The knowledge gained through the evaluation of the Discover Earth project about the nature of informal science learning in libraries will benefit both libraries and the informal science education (ISE) community. A two-day orientation and program planning workshop for two library staff (Project Director and Project Coordinator) from each host library was held on February 9 and 10, 2016 at the Anythink Huron Branch Library in Thornton, Colorado. The workshop included an overview of STAR_Net and the exhibit as well as hands-on science activities from the Lunar and Planetary Institute, programming and outreach consultation with the Afterschool Alliance; and a number of professional training resources, including the STAR_Net Online Community. Space exploration and research will help us answer the age-old questions: Where did we come from and are we alone? NSF and NASA research programs are helping humanity understand the origin and evolution of galaxies, stars, and planets, and defining the conditions necessary to support life beyond Earth. The four exhibit areas are: A. SPACE – The Final Frontier, B. Electric Space, C. Exploring Our Solar System, and D. Cosmic Journey. 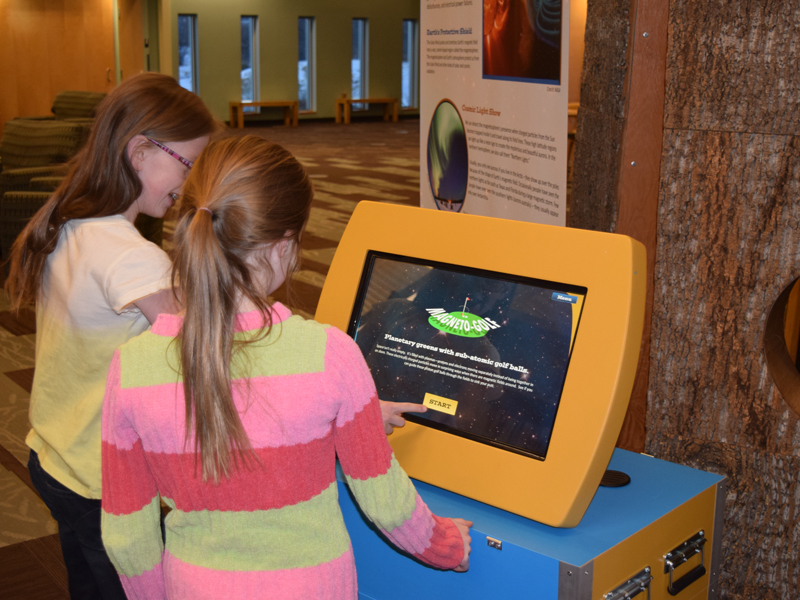 Discover Space features a 42” Touch Table on which patrons will be able to build solar systems in a game called Planet Families. The exhibit will also feature a touchable meteorite collection, including a 10-pound meteorite (4.5 billion years old!). A Space Weather Kiosk displays four digital interactives including Magneto-Golf and a Solar Monitoring Station that shows near-real-time changes in the Sun’s atmosphere and photosphere. 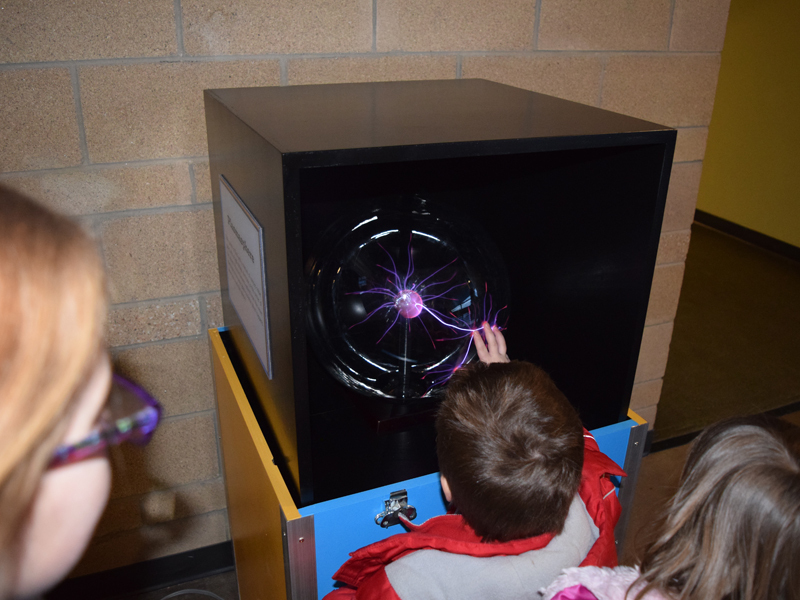 Visitors can interact with a 15” diameter and learn about plasmas, the 4th state of matter. 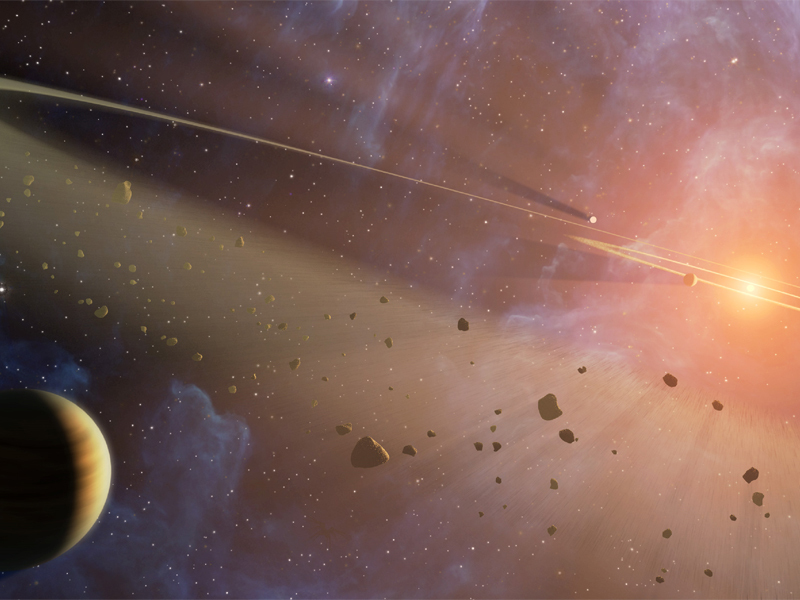 One 4K monitor displays stunning video of our Sun and an animation of space weather. The other 4K display shows The Cosmos, a collection of the best images of Earth, the Solar System, and the Universe Beyond. The Discover Space Quiz Show is a fast-paced and humorous version of a TV game show. Up to three patrons can play the game with a host (an animation of a Mars Rover) asking questions about space science and astronomy and providing the answers. 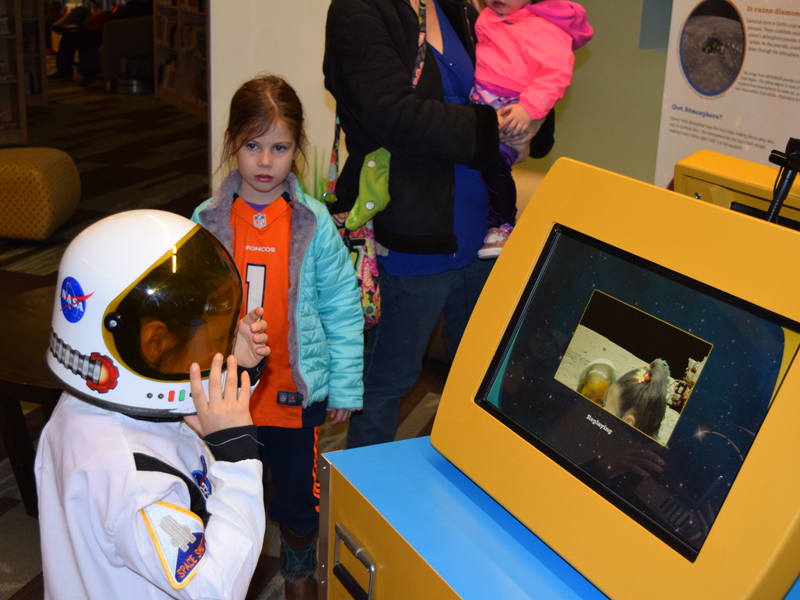 The Mission to Mars Kiosk takes patrons on a journey to Mars and back. Asteroids and comets are featured in the Space Rocks Kiosk that includes a touch screen featuring games such as What if it Hit My Town and Asteroid Impact. Hands-on interactives also include a Daily Planetary Report Station, where patrons can step in front of a green screen, don an assortment of costumes and give a report from various locations in our Solar System such as Mars and a moon of Saturn. This station includes props and could get a little noisy. 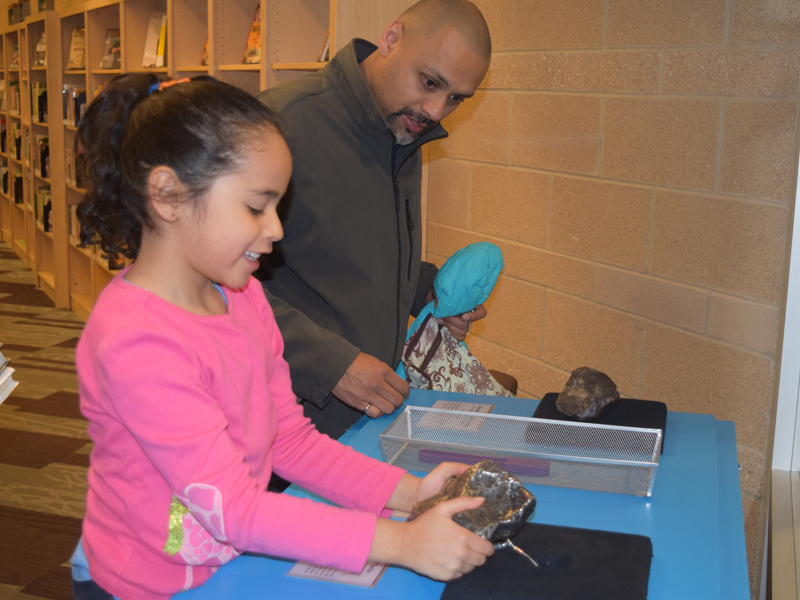 Also included are two Discovery Stations with various space-themed, hands-on activities such as designing and building robotic rovers (using Legos and other equipment).